Improper posture causes an imbalance of the whole body and prevents the proper functioning of the internal organs and may even lead to many diseases. The symmetry is the original, normal and healthy state of the human body. According to the Japanese therapist and founder of Yumeiho therapy, Masayuki Saionji, when the body is symmetrical, muscles and tissues are soft and blood circulation is good. But if there is a disorder of the balance and the body loses its original symmetry, this may cause problems of the musculoskeletal system and internal organs diseases may develop. 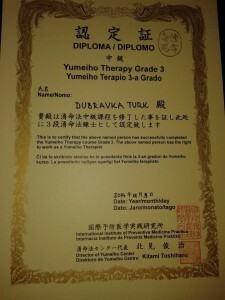 Yumeiho massage re-establishes the symmetry of the body, relieves or eliminates back pain and neck pain, some forms of headache, and pain related to the spine. It has a positive effect on a number of other issues that arise as a result of disorders of the center of gravity. Therapy is made up of three components that alternate and mutually complement each other. The first method comprises of crushing and the other method is exerting pressure. Their purpose is to soften and relax soft tissues. The third component includes methods for fixing bone and joint structures. Diagnosis is made from symptoms that a therapist determines based on the observation of face, shoulder position, body posture while a client is walking, standing and sitting. Then the client lies down on his stomach and in that position, muscle tension is estimated, as well as leg length and if a rotation of the pelvis has taken place. While working on a client, the therapist feels under his fingers the areas that are tense and which are not, and passes over them again trying to balance the left and the right side. Massage / therapy is generally performed once per week, depending on the severity of the problem and lasts from 30 minutes to 90 minutes. During the treatment, the client is dressed in comfortable cotton clothing. The therapy / massage is performed in a sitting / kneeling position and lying down on a mat. 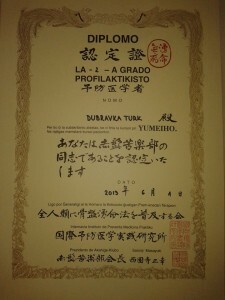 Yumeiho can be carried out in all age groups. 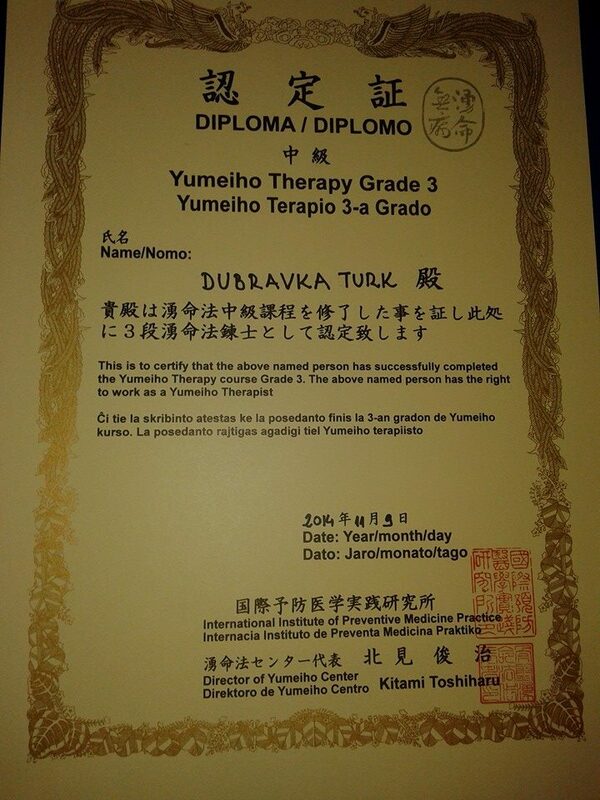 Yumeiho is very helpful for children from 4 months and for pregnant women who, due to the weight of the abdomen, often have major back problems. Since abdomen grows during pregnancy, it changes the center of gravity resulting in pain occurring in the back, neck, headaches etc.. The treatments are usually not performed in clients suffering from haemophilia, infectious disease or in psychiatric patients (in the case of paranoia and similar disorders), people with glaucoma, herpes zoster, inflammation of blood vessels and disk herniation in the acute phase.